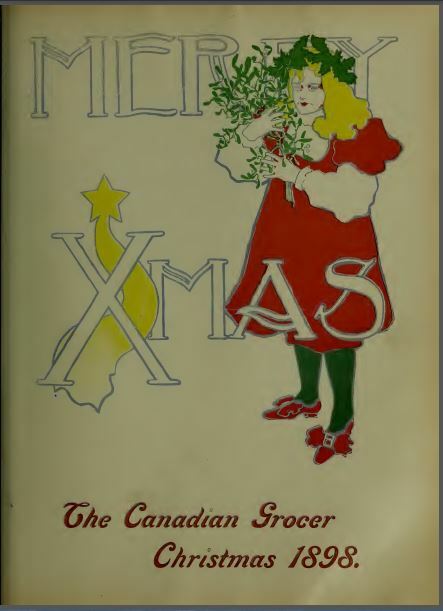 Christmas Greetings from The Canadian Grocer magazine December 1898. Today is Christmas Day and I’m staying in my childhood home with my family. After mentioning a few weeks ago that I could get a farm fresh duck, it was decided that duck would be the fowl for Christmas dinner this year. So today I used the Roast Duck recipe in The New Galt Cook Book (1898) that Mrs. A. Taylor contributed. I also planned to serve Teetotallers’ Christmas Pudding with Caramel Sauce for dessert. I picked up the duck from Amy a couple of days ago. It had led a happy life roaming around the farm before meeting its destiny. I didn’t need to singe or draw the bird but I did pick a few more pin feathers from it before removing the giblets (heart, lungs, and liver) and the neck and washing and drying the bird. I put the giblets and neck in a pot of water to boil. As soon as the giblets were cooked I removed them and left the neck to continue cooking. Time to make the dressing. I chopped the giblets and also an onion into very small pieces. I put them in a frying pan with a bit of butter to fry. Meanwhile I had two slices of stale bread soaking in some milk. Once the onion and giblets were fried until the onions were slightly golden I squeezed the bread and poured off the milk. You might be wondering why I chose to soak the bread in milk. The recipe doesn’t mention what liquid to use so I decided milk might work well. I mixed the fried giblets and onions with the bread and then started wondering whether the bread was supposed to have been fried with the other things. I ended up putting it all back in the frying pan to see what would happen to the bread. I let it fry a tiny bit and decided that the bread wasn’t to be fried. I seasoned the dressing with salt, pepper and ground sage before putting it in the duck. I placed the bird (breast side up) on a rack in a shallow roasting pan and rubbed some salt and pepper into it. I’d held back a bit of the onions and giblets and put them in the bottom of the roasting pan since I wasn’t sure if that was what was intended in the instructions. It is hard to get salt pork here so I decided to put pieces of bacon on top of the duck’s breast. I poured a cup of water in the bottom of the pan before I put it in the preheated oven. I decided to try roasting it at 375 F. since the instructions said a moderately hot oven. My duck weighed 5.5 lbs so I thought roasting for 1 1/2 hours might not be long enough so I planned the rest of the meal to be ready no earlier than two hours from the moment the duck went into the oven. I checked it every half hour or so and attempted to baste it. I discovered their was an instant read thermometer in the house so I used that modern invention to confirm that the duck was cooked. It was in the oven for two hours before I removed it and set it aside to rest while I made the gravy. To make the gravy I scraped some of the drippings from the roasting pan avoiding as much grease as possible and added it to the water used for boiling the neck and giblets. I made a paste of flour and water and then added some of the hot liquid duck juices to it. then I added the flour mixture to the juices in the pot, stirred and turned up the heat. 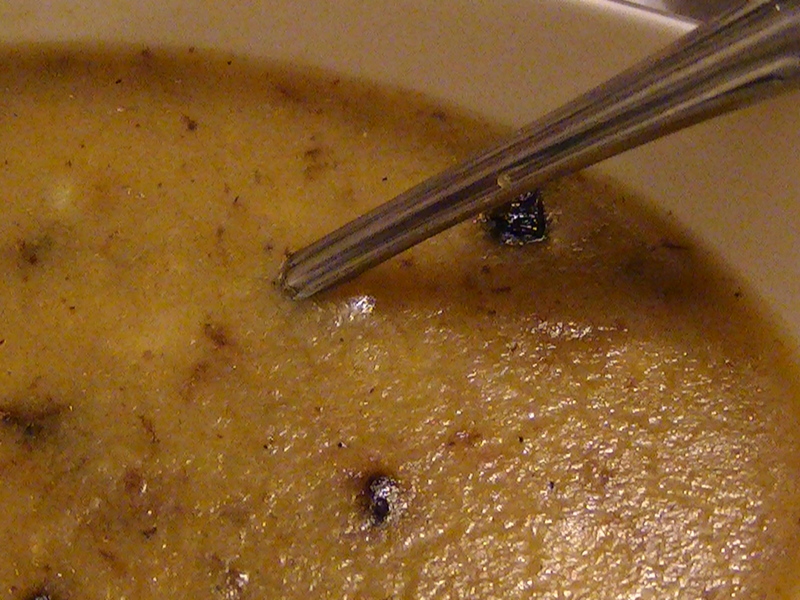 I kept stirring to avoid lumps and seasoned this gravy with salt and pepper. It was time to bring to the table the Roast Duck on a platter ready to carve along with the gravy in a sauce-boat to enjoy with the rest of the meal (mashed potatoes, baked squash, stuffing, cranberry orange sauce, and salad). I’d also made the Potato Rolls from day 64. I cut the first slice from the duck and started serving everyone as they helped themselves to the rest of the food. We sat down to enjoy our Christmas dinner together and eventually report on the taste of the roast duck. Once the duck was in the oven roasting I started preparing Teetotallers’ Christmas Pudding. I was stymied by the lack of currants and peel but decided to go ahead and make this recipe using two kinds of raisins and substituting crystallized ginger for the peel. Ginger appears in some other pudding recipes so it is appropriate if not completely accurate for this recipe. Again my lack of a kitchen scale meant I had to rely on conversions from the internet. It was soon obvious that I didn’t have enough ingredients to make the full recipe so I cut it in half. I put 1 pound (4 cups of sultana raisins in a bowl along with 1/2 pound (1 1/2 cups) of golden raisins instead of currants. One advantage of modern life is the availability of prepared suet. I didn’t have to do any chopping. I measured out 1 pound (3 3//4 cups) of suet and added it to the bowl. I stirred and then started preparing the rest of the ingredients. I added 1/4 pound (3/4 cup) brown sugar and then chopped 3 ounces (3/4 cup) of crystallized ginger before stirring it into the rest. I beat 3 eggs with 1/2 quart (2 cups) of milk and then poured it into the bowl. Once it was mixed I added 1/2 ounce of spice. I decided to use 1 tablespoon of cinnamon and 1/2 tablespoon of nutmeg. I stirred well as I added the last ingredient 1 1/4 pound (about 4 cups) flour. It was time to get this pudding steaming or boiling. I thought I’d remembered my pudding mold but had to substitute a glass bowl with a good edge to tie down a cloth. I filled the bowl 3/4 full with some of the heavy pudding batter and then put cheesecloth over the top of the bowl. I held it in place by tying string around the edge of the bowl’s lip. I put the prepared bowl in a pot of water making sure the water came up to the level of the pudding but not over the top of the bowl. I put the lid on the pot and turned up the heat. I left it to boil for three hours topping up the water twice. I really wasn’t sure how long this pudding was to boil but guessed that three hours might be enough. After we’d eaten the main part of the meal and done some dishes I started to prepare the pudding sauce before removing the pudding from the pot of boiling water. I decided to try Mrs. A. Taylor’s recipe for Caramel Sauce thinking it might go well with this rather plain pudding. I put 1 cup of sugar in a heavy sauce pan and turned up the heat quite high. The cup of water was nearby so that I wouldn’t have to stop stirring. I kept stirring as the sugar quickly started to melt and turn colour. I kept stirring until it was completely liquid and a nice amber colour. I poured in the water and the sugar seized up but I kept stirring and soon it melted back to a brown liquid. I set the timer for two minutes and left it to boil while I started getting the pudding ready to serve. I carefully removed the bowl from the water and then cut the string to remove the cloth. I poured off a bit of liquid that was sitting on top. It seemed to be a bit of water and melted suet. I slid a knife around the edge of the bowl to loosen the pudding before unmolding it onto a plate that is a family heirloom. 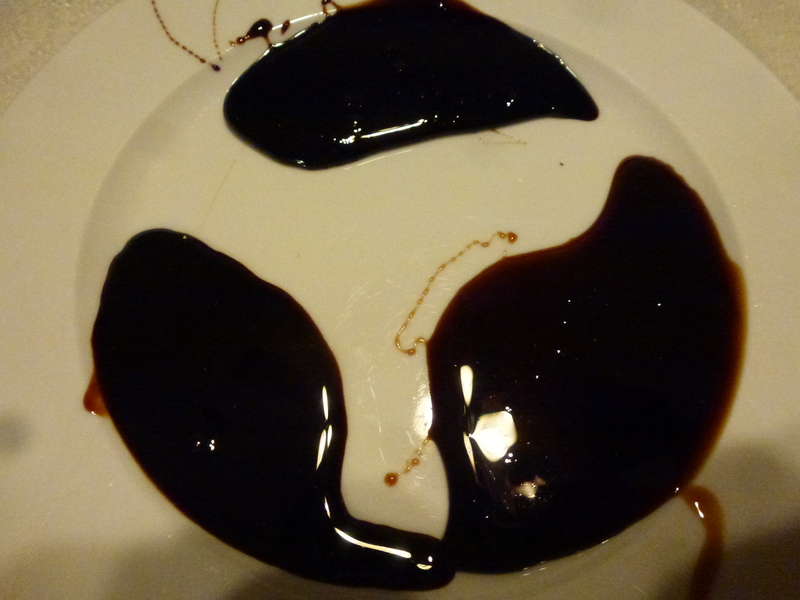 I poured the completed Caramel Sauce into a sauce-boat and gathered the family for dessert. My parents don’t drink alcohol so the Teetotallers’ Christmas Pudding was very suitable for our family Christmas dinner. I cut slices for everyone and poured on some sauce. It was time to taste. Mrs. A. Taylor contributed quite a number of recipes including today’s roast duck and the caramel sauce recipe for the pudding. She is Scottish born Margaret “Maggie” Fisher wife of another Scottish immigrant Alfred Taylor. Her recipes cover a broad spectrum of the range available in the many chapters of The New Galt Cook Book. I’ve tried making fifteen of her contributions to the chapters on eggs, puddings, sauces, candy, soups, and cheese as well as other poultry recipes. 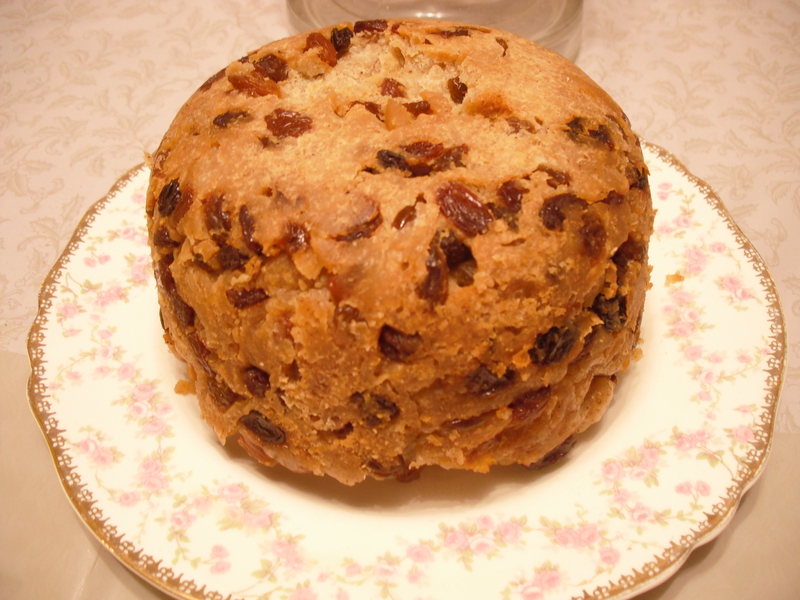 Mrs. Hunt of Speedsville shared her recipe for Teetotallers’ Christmas Pudding. Ironically I made her baked squash recipe on Day 50. Matilda Ann Hudson was born in England in 1836 and married James Hunt in 1858 when she was 21 years old. James and Matilda lived in Preston when they married but later lived in nearby Galt and Speedsville. Their only child a daughter named Violet V. Hunt was born in 1867. James was involved in the woolen industry but suddenly died of a heart attack in Speedsville in 1896. He was 61. Matilda died in 1913 of pneumonia. 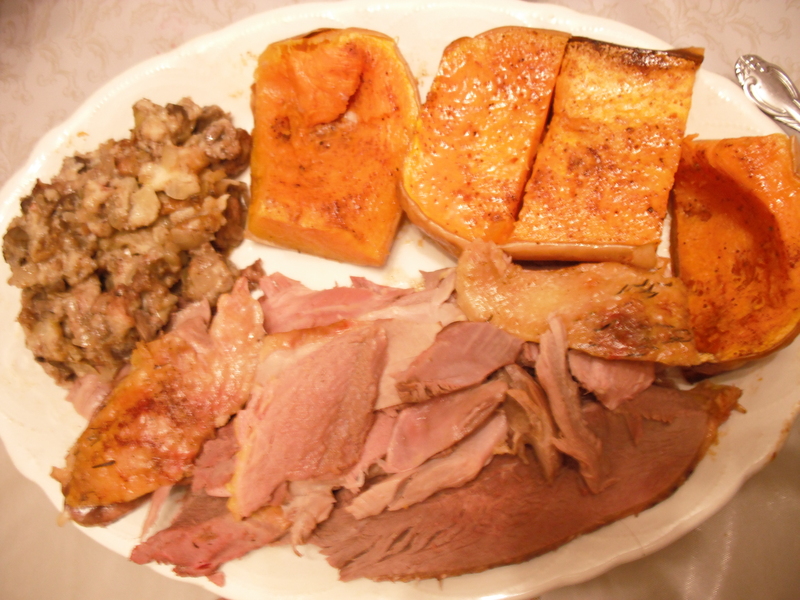 Slices of Roast Duck with dressing and baked squash. So how did everything turn out? I’m sitting writing and digesting a good meal. 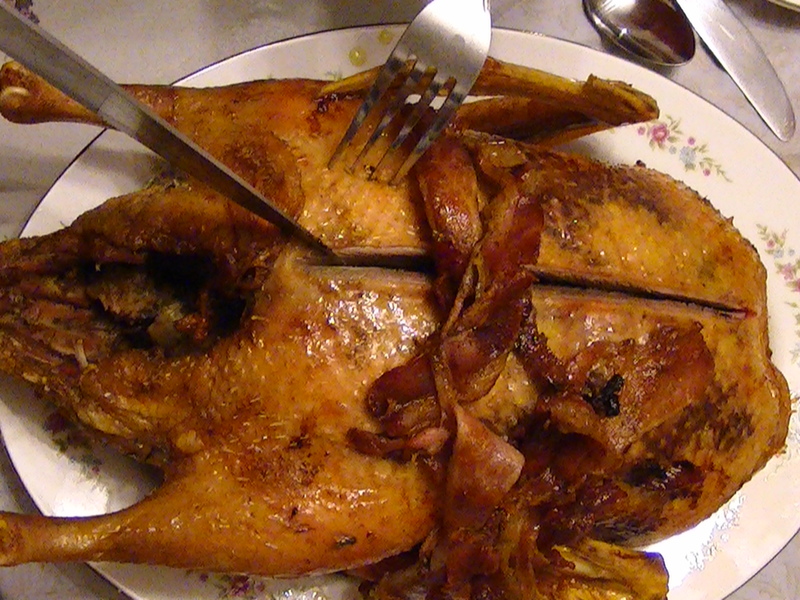 Everyone tried the roast duck except my brother who’d once had a pet duck (something I’d completely forgotten). Those of us who prefer white meat when eating chicken or turkey weren’t as keen on the all dark duck meat but the other tasters really liked it. It wasn’t greasy as I’d feared. The skin was crispy and the meat very tender. The dressing was very moist and not nearly as fatty as I’d expected. It tasted good. The big surprise was the gravy. It was a success and popular! I normally make horrible gravy but this tasted like a wonderful mushroom gravy despite not containing any mushrooms. The giblets must have been the mystery element that gave it a mushroom flavour. I’d added some chopped orange when I made the typical cranberry sauce and it went very well with the duck. The potato rolls were also a big hit. The Teetotallers’ Christmas Pudding was okay. Everyone ate their serving and the substitution of ginger worked very well — better than peel. The pudding is a bit stodgy. It isn’t very sweet – a plus when there are so many sweets available at this time of year. The Caramel Sauce tasted great with this pudding (and so did the preserved pears with ginger I made two days ago). I might try frying a slice tomorrow for breakfast. I hear it is a good way to enjoy steamed puddings in the days to come… and considering how much pudding is left we are going to have to get creative to use it up. Singe, draw, wash thoroughly, wipe dry and fill with the following dressing: Two slices stale bread soaked and squeezed dry, a small onion chopped fine, season with salt, pepper and sage, boil the giblets, strain, chop fine, mix all and fry a light brown, place in pan with some slices salt pork on the breast, put a small cup of water in pan, baste frequently, have a moderately hot oven, roast an hour and half, thicken the gravy with a spoonful of flour stirred smooth together. Pick and stone two pounds good raisins, pick, wash and dry one pound currants, chop two pounds beef suet. Have ready half pound brown sugar, six ounces candied peel — them, two and a half pounds flour, six eggs, one quart or more milk, one ounce mixed spice and one tablespoonful salt. Mix rather stiff. Use with or without sauce. One cupful granulated sugar, one cupful water. Put the sugar into an iron saucepan; stir with a wooden spoon, over a quick fire, until the sugar melts and turns an amber color, then add the water, let boil two minutes and turn out to cool. I woke up to snow this morning and since I don’t have to work today, I can consider making something that takes some time. Steamed puddings always come to mind, and although I’ve made eight different puddings so far, there are still many many more in The New Galt Cook Book (1898). 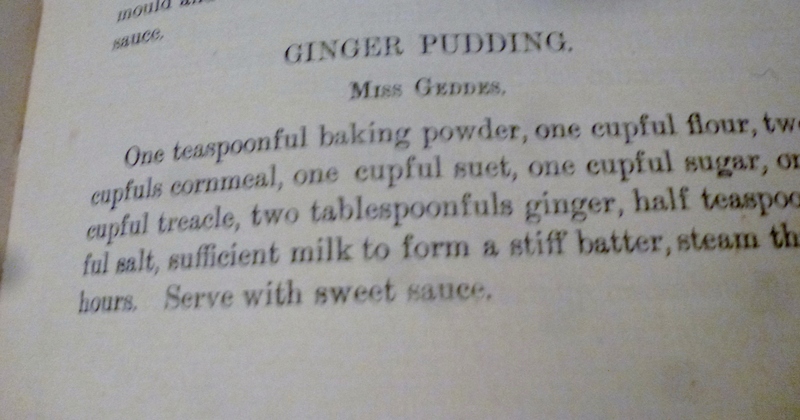 Today I decided to try Ginger Pudding using Miss Geddes recipe. It suggests a sweet sauce to accompany the pudding so I’m making one simply called Pudding Sauce. There is no name under the sauce recipe. This seems to be one of those dump and stir recipes. I don’t think anything has to be added in any particular order so I’m going to add things in the order listed in the recipe. First I added 1 teaspoon baking powder and then 1 cup of all purpose flour. Next I added 2 cups of cornmeal and stirred so that these dry ingredients were mixed before adding the 1 cup of suet and 1 cup of white granulated sugar. Sugar today is much as it was in 1898 but I am using a very convenient form of suet compared to a woman in 1898. I buy frozen bags of suet from the meat area of my grocery store. It is already in tiny bits. A woman like Miss Geddes would buy a chunk of suet (the hard fat from around the kidneys of an animal) from the butcher, take it home and clean it, chop it, and shred it. I imagine it had to be used in a timely way since I’m not sure how long it would keep. Next I added 1 cup of treacle. 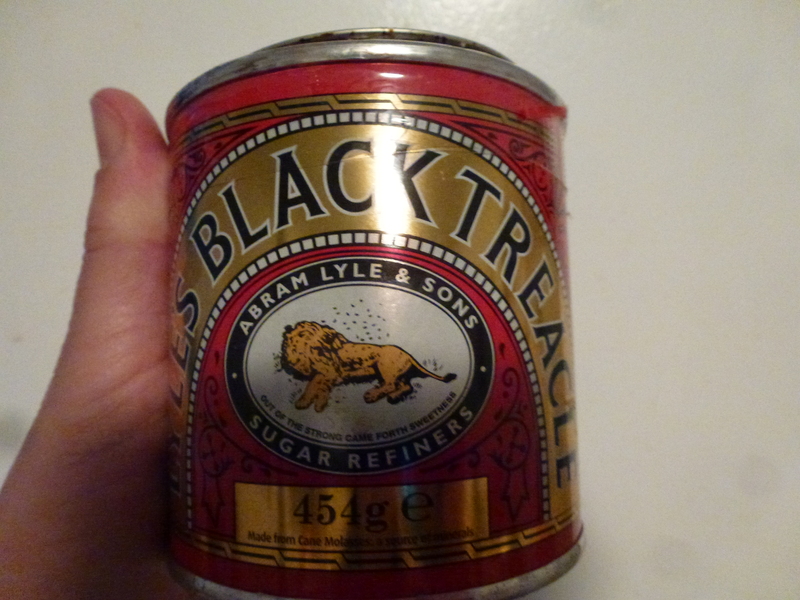 I happen to have a can of treacle on hand. I purchased it out of curiosity while shopping in a specialty store — probably one that specializes in English, Irish, Scottish and Welsh foods — although I enjoy poking around in any place that sells edible ingredients. I never know where I’ll find foodstuffs and equipment suitable for historic style cooking. I decided to do a taste comparison of Lyle’s Black Treacle, President’s Choice Fancy Molasses and Crosby’s Blackstrap Molasses to see if there was much difference. You can see from the picture that they look much alike. The flavours are slightly different. The fancy molasses was sweeter. The blackstrap was stronger flavoured and not as sweet. The treacle was thicker and tasted somewhere in between the other two. For more about treacle and molasses try this site. Crosby‘s is a Canadian company that has been selling molasses since 1879. It’s usually their fancy and family types that I have in my pantry. The final ingredients are 2 tablespoons of ground ginger and 1/2 teaspoon of salt. I added 1 cup of milk to end up with a stiff batter. The lack of a precise measurement for the milk bothers people today but would have been very understandable in 1898. It is still a more accurate way to cook today although using weight measures is even more precise. Dry ingredients will soak up more liquid in dry environments such as a heated kitchen but will need less liquid on humid days or if they are fresh instead of sitting in a cupboard for months as mine do in years when I am not cooking every day. I mixed everything together and spooned it into a greased pudding mould. I put the pudding in a large pot of hot water and left it to boil for three hours. I checked every hour and topped up the water. After two hours I started preparing the sauce. I creamed 4 tablespoons of white granulated sugar, 2 tablespoons of butter and 1 tablespoon of flour. Next I separated 1 medium egg and beat the white. I mixed the beaten egg white with the creamed mixture and then poured 2 cups of boiling water into the bowl. I stirred it quickly and added a few drops of lemon flavouring. It seemed very “thin” so I decided that perhaps it was supposed to be cooked. My only clue was the inclusion of flour. What was the point unless it was meant to thicken the sauce and it certainly wasn’t thickened sitting on my counter. I poured it from the bowl into a small saucepan and kept stirring as it came to a boil. I did begin to thicken, not much but enough that it could be considered a sauce. I left it to cool and once the time was up for the pudding I removed it rom the mould and cut a slice. I poured some of the sauce around it and was ready to dig in. The sauce is a disappointment. It is okay but there are better pudding sauces. I guess one advantage is that it isn’t very sweet but it isn’t very much of anything including flavour or thickness. The ginger pudding fares a bit better. There are hints of ginger and the treacle flavour dominates which is great if you like molasses. The other interesting characteristic is the cornmeal. It adds a very different texture to this pudding compared to those based on various flours. This is a very moist pudding which would keep well. 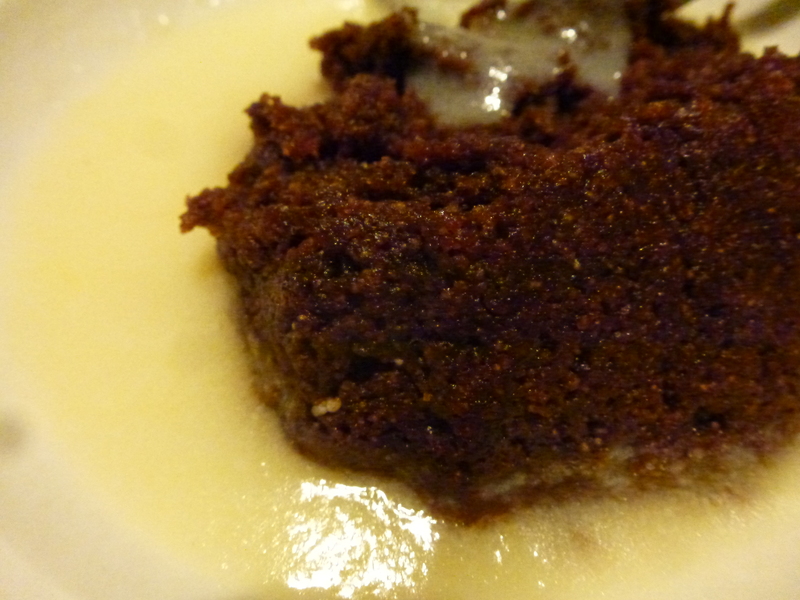 I’m not sure if I’ll bother making Ginger Pudding again and yet it is intriguing. I wonder if it originates with the old Hasty Puddings of early settlers to Ontario. I made one once over the hearth in a 1840s log cabin using a recipe from a much older cook book. Unfortunately I can’t remember the cook book but I remember the experience of slowly adding cornmeal handful by handful to a pot of lightly salted boiling water, stirring each time until I had a thick cooked mass, and then adding the finishing touch — a few spoonfuls of molasses. 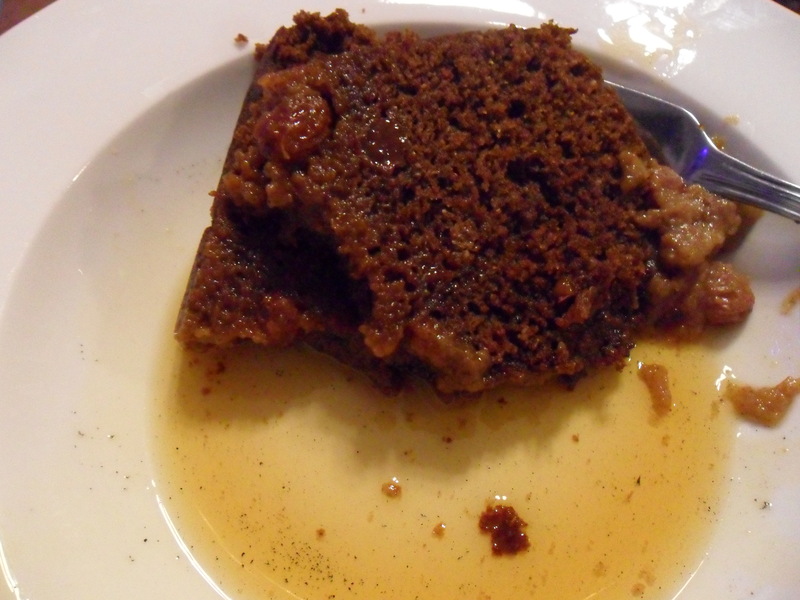 Taste can trigger memories and tasting Ginger Pudding has transported me back about 15 years to that log cabin. One teaspoonful baking powder, one cupful flour, two cupfuls cornmeal, one cupful suet, one cupful sugar, one cupful treacle, two tablespoonfuls ginger, half teaspoonful salt sufficient milk to form a stiff batter, steam three hours. Serve with sweet sauce. Four tablespoonfuls white sugar, two tablespoonfuls butter, one tablespoonful flour; beat all to a cream, beat the white of one egg to a froth, pour over the mixture a pint of boiling water, stirring fast, flavor with brandy,essence of lemon or ground cinnamon. I’ve been wanting to try this recipe for Cherry Pudding ever since I started this project and today is the day. I’ve been working for the previous seven days and I have all day today at home. The sun is shining but there are heaps of snow outside and it is cold. It is time to hunker down and make a treat. This one will bubble away for hours. I happen to have some dried cherries so I’m going to try making Miss McNaught‘s Cherry Pudding recipe in The New Galt Cook Book (1898). It suggests serving with a wine sauce so I’m also making Wine Sauce using a recipe contributed by someone named S.B.C. Dried cherries are available at my local grocery store among the other packages of dried fruit. They are not cheap but the flavour is amazing. I measured 5 cups (1 quart) of all purpose flour into a large bowl and then added 3 cups of dried cherries — two packages of the brand I bought. The recipe says to rub the dried cherries into the flour but I don’t know what is intended by that direction. This is not a moist ingredient like butter or lard. Is it a way to break up the cherries that are sticking together? That’s what I assumed and made sure that each cherry was separate. The cherries are large so perhaps the direction was meant as a way to break the cherries into smaller pieces. I didn’t end up with smaller bits so I continued to the next part of the recipe. I added 2 teaspoons of cream of tartar, 1 teaspoon of baking soda and 1 saltspoon of salt. If you don’t have a real saltspoon or a measuring set that includes this measurement don’t despair. It means 1/4 teaspoon of salt. In a separate bowl I beat 4 medium eggs and then added 2 cups of white granulated sugar. Once this was well mixed I added 1 cup of milk. I added the liquid ingredients to the dry and mixed well. This made a very thick dough so I needed to use a spoon to put it into a well greased pudding mold. Don’t fill a pudding mold right to the top. You need to leave room for the batter to expand. Once the cover was on the mold I put it in a large pot of hot water. The water should come up the side of the mold but no so high that it will seep into it. I left it to boil for an hour and then checked if it needed more water. Cherry Pudding in all its glory. While the pudding steamed I made the wine sauce. I creamed 2 tablespoons of butter with 1 cup of white granulated sugar. Then I added a beaten medium egg. I blended it all together and grated a little fresh nutmeg. I put 1 cup of water on to boil. I measured 1 tablespoon of corn starch in a small bowl and added cold water. I added enough so that the corn starch would be entirely liquid when added to the boiling water. Otherwise there is a risk of lumps. Once the water was boiling, I added the liquid cornstarch and stirred well. It quickly thickened so I added the 1/2 cup of wine. I used some leftover white wine and stirred. Next I removed the pot from the heat and poured it slowly into the bowl of butter, sugar, egg and nutmeg. I stirred well as I poured and it seemed to work. Yes, this means that the egg is essentially raw in this sauce but I still wanted to sample the wine sauce with the cherry pudding. After three hours of boiling/steaming I removed the pudding from the pot and tried to unmold it. It came away from the sides quite well. I cut a slice of pudding and poured some wine sauce around it before taking my first bite. Miss McNaught is probably Frances “Fanny” McNaught one of the co-editors of The New Galt Cook Book. She was born in Fergus Ontario but also lived in Brantford as a child and then later in Galt. She worked briefly as a school teacher but spent most of her adult life living with her sister Margaret Young and her brother in law. I suppose in some ways she is the classic spinster sister. She died of heart trouble in 1919 at the age of 75. My first bite was quite the taste sensation. Tart cherry, bland cake, and a smooth sauce with a hint of wine and nutmeg. I liked the sauce alone but it really came alive with the pudding. The cherry pudding on its own is not very exciting and a bit disappointing to me. It isn’t very sweet which is probably a good thing especially combined with the wine sauce. 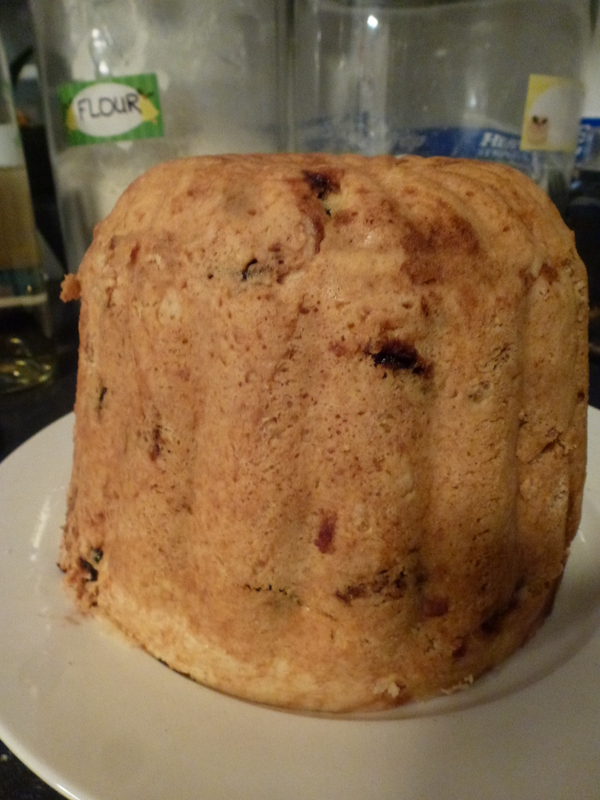 The pudding is very dense so I think I used just a bit too much flour. A quart is a tricky measurement since it can be liquid or dry and an Imperial dry quart is slightly larger than a US quart. Measurements are one of the issues when cooking from early English language Canadian cook books. Both our spelling and our measurements are influenced by the combined effects of the United States and Great Britain. You might have noticed that the spellings in this cook book would be considered American today. There’s no ‘u’ in colour for example. For most measurements it doesn’t matter too much if the intent was the Imperial size or the American one. However, the larger the measurement the more the difference is noticeable. I was once on a train that originated in Chicago and was destined for Toronto. It ran out of fuel. After watching the AmTrack and ViaRail crews arguing with each other I have always suspected that conversion mistakes were made between the US gallon and Imperial gallon into the metric litre. You can find out more information about the variations in Imperial and US measures here. 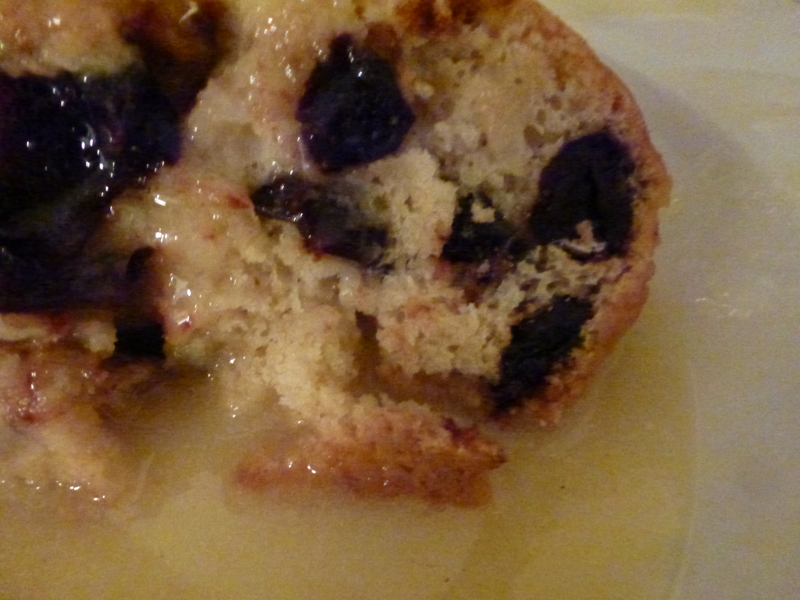 I think Miss McNaught’s Cherry Pudding has some potential and S.B.C.’s Wine Sauce is the perfect accompaniment if you can avoid fretting about raw eggs. Next time I’ll try making the sauce with a robust red wine. The colour and taste of the sauce should combine well with a slightly lighter version of the pudding. I tasted the wine sauce cold and it is still good. The wine flavour is a little more pronounced. The pudding is better warm. One quart flour, three cupfuls of dried cherries rubbed into the flour; beat four eggs with two cupfuls of sugar, one cup of milk, one teaspoonful of soda, two teaspoonfuls of cream tartar sifted into the flour, and saltspoonful of salt. Boil two or three hours. Serve with a wine sauce. One cupful water, one tablespoonful corn starch, two tablespoonfuls of butter, one cupful sugar, one egg, a little grated nutmeg, one-half cupful wine. Wet the corn starch in cold water, and stir into the boiling water. Boil ten minutes. Rub the butter and sugar to a cream, add the egg, well beaten, and the nutmeg. When the cornstarch is cooked, add the wine, and pour the boiling mixture into the egg mixture and stir till well mixed. Several people have mentioned to me that the recipe for carrot pudding from January 2 is just like one made in their families but it is always served with caramel sauce. I decided to see if the Pudding Sauces section of the 1898 New Galt Cook Book includes a recipe for this type of sauce. And there it is on page 172 — a recipe for Caramel Sauce contributed by Mrs. A. Taylor. The recipe appears so simple I thought I’d be cheating you of a more detailed entry so I decided to make another pudding. I am going to try Graham Pudding. There are two similar recipes but I’m going to make the one contributed by Mrs. Nelles of St. George. 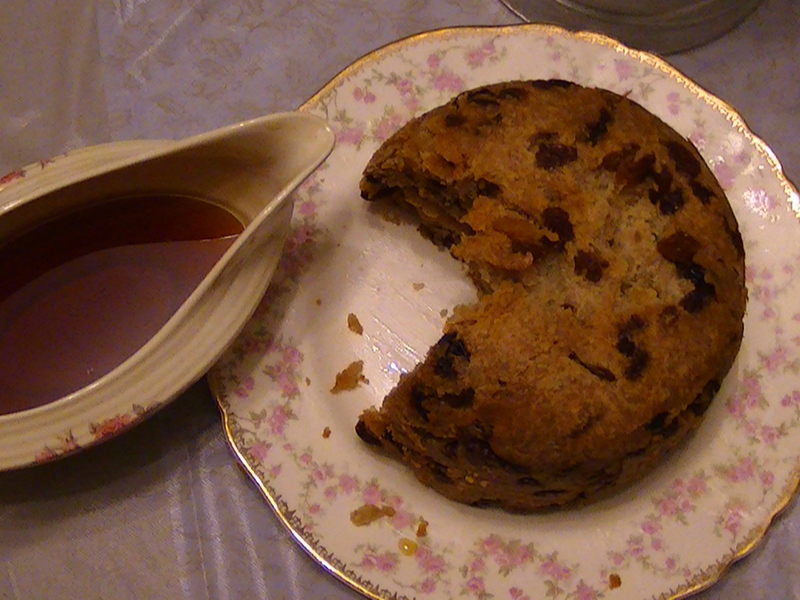 It seemed a suitable pudding to pair with a sweet pudding sauce. It also includes molasses which reminded me of the old phrase “as slow as molasses in January”. It is cold enough lately for molasses to move very slowly. I prepared the pudding first. It is very difficult to cook with historical accuracy when dairy ingredients are involved. Milk today in Ontario is homogenized and pasteurized making a safe stable product for consumers. However, these two processes were not typical in 1898. Milk would sour but could still be used. To recreate the natural souring of milk, modern cooks can add a teaspoon of vinegar to a cup of milk. The other challenge is to determine an appropriate fat content of milk used by cooks in 1898. Cows in commercial dairy barns are not exactly the same type found in 1898. Cattle have been bred for modern life. Many years ago a dairying friend did some research and decided that using skim or 1% milk would best reflect the milk of an earlier time since most farmers would sell the cream separately. I used 1% milk for this recipe. I put one cup of sour milk and 1 cup of molasses in a bowl. Next I added 1 medium egg. I melted some butter and mixed 1 tablespoon into the bowl. I measured two small cups of Graham flour into another bowl and mixed in the cup of raisins. Coating them with flour helps prevent the raisins sinking in the pudding. I added the spices — 1/2 teaspoon of allspice and cloves and 1 teaspoon of cinnamon — to the bowl of flour and raisins. I mixed the dry and liquid ingredients together. I dissolved the baking soda and salt in a little water. This final ingredient was stirred with the rest. I poured this very liquid batter into the greased pudding mould. The pudding mould went into a pot of hot water to boil/steam for two hours. Next I carefully prepared the Caramel Sauce. I find it scary and magical to watch sugar turn to caramel. I am always so afraid it will burn. I put one cup of white sugar in a small heavy pot. I turned the heat to high and stirred with my wooden spoon. Slowly the sugar melted. As I stirred it kept turning into chunks of sugar. I wasn’t sure it would work but eventually I had an amber coloured liquid. Now to add the one cup of water. The recipe doesn’t specify a temperature so I added cold water. Should I add it all at once or slowly? I poured a little in and the steam was incredible. I dumped the rest in, stirred, and tried to tolerate the steam. Quickly the steam disappeared but now I had a sticky chunk of amber “candy” in brown water! I kept stirring with the heat high and hoped that eventually everything would blend. Once it came to a boil I started timing. I had to let it boil a little longer but finally I had a smooth liquid. I removed it from the heat and let it cool a little. I thought Mrs. Nelles of St. George could be Barbara Crabb who married James E Nelles but she died in 1891. As far as I can tell none of the sons is married by 1898. Instead I think Mrs. Nelles is Alice Cynthia Patten. She was born in 1858 in St. George and married Henry Wentworth Nelles when she was 23 and he was 31. They had two boys born ten years apart. In 1891 Alice’s mother is living with them. The community of St. George is celebrating its bicentennial this year. I’m not sure of the identity of Mrs. A. Taylor either. Andrew Taylor doesn’t marry until 1911. Instead Mrs. Taylor could be Margaret Elliott, wife of Alfred Taylor.Both were born in Scotland but arrived in Canada as small children. In 1891 they live in Galt and have two children. The pudding is okay. For some reason mine was cooked nicely at the bottom but was gloopy at the top once turned out onto a plate. It tastes a bit like gingerbread but next time I’ll adjust the spices a little. I’ll use more cinnamon and a bit less cloves. I will try this one again as I’m not sure what went wrong with this recipe. Unlike some of the other pudding recipes, this one is suitable for vegetarians. The caramel sauce was a bit thin. Again I think I made a mistake in adding the water. Next time I’ll try adding hot water a little at a time. The Caramel Sauce complemented the Graham Pudding so this combination works. Is this kind of caramel sauce part of your family tradition? One cupful sour milk, one cupful molasses, one egg, one tablespoonful melted butter, one teaspoonful soda (dissolved), one cupful of raisins, two cupfuls of Graham flour (small); season with allspice, cloves and cinnamon, one teaspoonful salt; steam two hours.